At the end of World War II, the United States entered a period of extreme growth and change. Evidence of this growth and change can be seen in the development of the modern Civil Rights Movement. The fight for equality and resistance to discriminatory practices such as segregation of public facilities began in the nineteenth-century when Jim Crow legislation institutionalized segregation based on race. Although resistance to these discriminatory practices did not begin in 1945, the term Civil Rights Movement is often used specifically to refer to the struggles between 1945 and 1970 to end discrimination against African-Americans and to put an end to racial segregation. Several important events occurred during Georgia’s Civil Rights Movement including, the ending of the white primary in 1946, the Albany Movement, and the desegregation of the University of Georgia to name a few. Several Georgians played key leadership roles in the national modern Civil Rights Movement, including Martin Luther King, Jr. and Andrew Young. 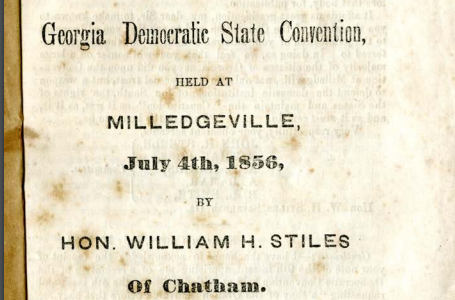 This primary source set includes five analyzed sources related to Georgia’s modern Civil Rights Movement. It also offers additional primary and secondary sources related to the topic. There are several excellent online sources related to Georgia’s Civil Rights Movement linked on this teaching guide as well. Click here to view the teacher guide to this primary source set. When America entered World War II in 1941, Georgia entered a new period of history. The Second World War funneled federal money into southern defense, and Georgia hosted more military installations than any other state besides Texas. Approximately 320,000 Georgians fought in the war and those on the home front built ships and airplanes, manufactured ammunition, grew victory gardens, bought and sold war bonds, wrote letters to soldiers, and more. In mobilizing for the war effort, Georgia’s economy shifted more towards industry and manufacturing than ever before, bringing Georgia more fully into the modern era and pulling it out of economic Depression. The following sources give students a look into the wartime effort, including the progression and regression on the homefront during these years. Like most places in the world, Georgia was affected by the First World War and played a major role, even as the country initially ignored the assassination of Archduke Franz Ferdinand. By the end of the war, though, the state housed many training grounds for American troops and contributed around 100,000 Georgians to U.S. forces. The war also affected much of the homefront, as women and African-Americans began taking part in the workforce when men went across the ocean, especially as white men were actively trying to prohibit black men from volunteering or being drafted to join the military. After the war, the rest of the nation was experiencing intense urbanization, but most of the South was remaining fairly rural and extremely segregated. When economic depression hit, African-Americans were hit hardest and many New Deal plans fell flat. These sources demonstrate Georgian life for blacks and whites during the First World War and through the Great Depression. The primary sources of the New South include many references to agriculture and the growth of the cotton industry in Georgia. This agricultural resurgence was one of the defining factors of Georgia’s New South, and GHS provides resources, such as the Atlanta Cotton States Exposition to demonstrate the gravity of this moment. Moreover, this set includes many opposing viewpoints on race, lynching, and the state of Georgia following Reconstruction. These views also shed light on the future of Georgia in the New South, a period of technological and agricultural growth. Georgia’s early years as a state were marked by expansion and growth. Georgia’s population grew after the Revolutionary period and the white population looked west for more elbow room. New technologies like the cotton gin and steam-powered rail led to expansion and growth of Georgia’s economy. It was in this period that cotton became king of the South, Georgia being no exception. Several defining historic events occurred during this period including, the Yazoo land frauds, the founding of the University of Georgia, the discovery of gold in North Georgia, the spread of Baptist and Methodist churches, the creation of a Cherokee syllabary, and the Trail of Tears. Click here to view and download a teacher guide for this primary source set. In 1732, the British crown granted the Georgia Trustees a charter to establish the colony of Georgia in the debated territory between British Carolina and Spanish Florida. The colony was governed by a board of men called the Georgia Trustees from 1732-1752. In 1752, the Georgia Trustees gave over control of the colony to the British government and Georgia became a Royal colony. By this time, the original philanthropic goals of the Trustees had given way under the weight of harsh conditions in the Colony, and the colonists had fallen into line with South Carolina’s economic plan with production of rice, lumber, naval stores and indigo. This type of agriculture was supported by the lifting of the ban on slavery in the colony of Georgia in 1750 and the easing of land policies.